Looks like I posted too quickly on the status of the Nigerian President. Nigeria’s president, who has not been seen since going into hospital in Saudi Arabia for heart treatment in November, has told the BBC he is recovering. In his first interview since then, Umaru Yar’Adua said he hoped to make “tremendous progress” and to return to Nigeria to resume his duties. 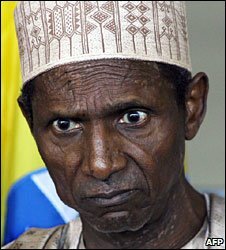 Nigerian opposition parties have been demanding evidence about the true state of Mr Yar’Adua’s health.